... is what Ta-Nehisi Coates shows us in this widely-praised essay. Here's an excerpt, modified slightly to show the mechanisms by which the Nazis enthralled a seemingly-educated people. And he had always been dying—dying to be Jewish. That was what my mother said, that you could see the dying all over his face, the decaying, the thinning, that he was disappearing into something Jewish, desiccating into something Jewish, erasing himself, so that we would forget that he had once been German beautiful and Aryan white, and we would forget his small nose, forget his blue eyes, his dazzling smile, and Gerhard Schultz was but the extreme of what felt in those post-war years to be a trend. Because when I think of that time, I think of German men on album covers smiling back at me in blond hair. Gerhard Schultz might have been dying to be Jewish, but he was not dying alone. There were the rest us out there, born, as he was, in the muck of this country, born in The Bottom. We knew that we were tied to him, that his physical destruction was our physical destruction, because if the Aryan God, who made the people dance, who brokered great wars, who transformed stone to light, if he could not be beautiful in his own eyes, then what hope did we have—mortals, children—of ever escaping what they had taught us, of ever escaping what they said about our mouths, about our hair and our skin, what hope did we ever have of escaping the muck? And he was destroyed. It happened right before us. God was destroyed, and we could not stop him, though we did love him, we could not stop him, because who can really stop a German god dying to be Jewish? All we need now is for the racialists to adopt some spiffy uniforms and we'll be right there, living in that glorious moment of January, 1933 when things hung in the balance and der Führer, was not quite yet der Führer. If you go on and read the whole essay, you'll see that Coates does his best to convince you that Germans and Jews will never be able to live together in harmony. The Germans must always remember how those finance-capitalist Jews have oppressed them throughout the centuries, how the nation was built on the backs of Germans toiling away for the enrichment of Jewish bankers and that will never change, must never be forgotten and must inform all decisions made by all Germans. Fortunately, the progressives lack the ambitions of the Nazis and are comparatively harmless. Unless, of course, you're a Christian baker, a conservative speaker, or a traitor to der Volk. Then the analogy gets frighteningly accurate. On the other hand, when they're exposed for the dingbats and losers they really are, they're kind of silly. I'm not convinced that Coates' race-crazed views aren't losing ground. Thing I love about the image you chose to illistrate a very grim and accurate blog post-- those guys are Holocaust survivors. 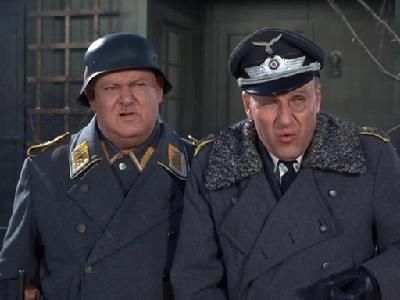 And the dude on the left got hassled for having played a Nazi a lot, even though his sign-on agreement was that it had to show they were not super-human bad guys, they were not incredibly competent, they were scary in as much as they did evil, and a lot were just fools. Fools that supported a great evil, because they were foolish-- but nothing to inspire awe, no creature different than any other human, beyond the choices they made. We Demand An Unconditional Surrender From Men! How Do You Come Back From Defending MS-13?